Since girlhood, I have enjoyed doing needlework of all kinds, including embroidery, cross-stitch, bargello, petit-point, applique -- well, you get the point. When I became enthusiastic about miniatures, it was only a matter of time before I brought my two loves together. In May 2010 I was honored to be selected for Artisan membership status by the International Guild of Miniature Artisans in the category of Needlework and Textiles for my French-knot rugs. The rugs below are examples of recent work done. French-knot items of most any size or style can be created to meet your special dollhouse or roombox requirements. Please contact me for additional details and pricing estimates. This miniature is based on a circa-1880 embroidered rug design by William Morris (b.1834 – d.1896), whose life’s work focused on the reform of society through the arts. He is widely considered the founder of the Arts and Crafts movement. In response to inferior production practices of the 19th century industrial age, design production firm Morris and Co. emphasized uniqueness of design and quality of production. Morris’ works are typically ornate with extensive floral elements, combining natural motifs, to create a sense of movement and elegance. He stressed the use of traditional techniques with natural materials and dyes. This rich design features Morris’ favorite motifs of acanthus leaves and flowers. Corinthe’s design extends the green and brown color palette to include pink and blue accent flowers. 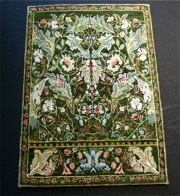 The pattern for the miniature rug was hand-drawn by me in late 2009, referencing an on-line photograph (attached). Green tones were modified due to personal preferences; some details were eliminated in order to accommodate miniature scale restrictions. The 1” scale rug was stitched using single-wrap French knots on 100% cotton muslin. There are approximately 1600 knots per square inch, created using a single strand of cotton embroidery floss and a #12 crewel needle. Stitching and finishing were completed in March of 2010. Finished size: 6.5” x 4.7”. This miniature rug was inspired by a hooked rug created in 1939 by Violet Lintott, grandmother of IGMA Fellow Joyce Metcalf of Eugene, Oregon. My version of the rug uses a complementary color scheme with few “supporting” colors, removing the distinction between the outer and inner backgrounds. The stitch pattern was hand-drawn by me in May of 2008, based on a rough sketch previously done by Joyce. In addition to changing the color scheme, I made the rug wider, and included modifications to the floral arrangement. The design provided opportunities to experiment with shading techniques both in the foreground elements and background. No variegated floss was used. 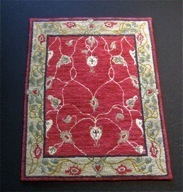 The 1” scale rug was stitched in single-wrap French knots on 100% cotton muslin. 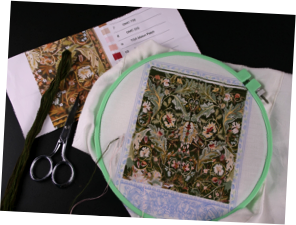 There are approximately 1600 knots per square inch, created using a single strand of cotton embroidery floss and a #12 crewel needle. 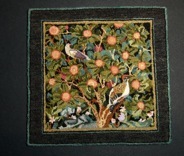 Stitching was completed in June of 2009, and finishing in March of 2010. Finished size: 4” x 6”. In the 1920’s, a North Carolina textile mill owned by Marshall Field & Co. developed a process for creating high-quality, machine-made oriental design rugs that could be sold at realistic prices. Difficult to distinguish from imported originals, the rugs were introduced by Wanamaker’s New York department store in 1928 under a new brand: Karastan. The original Arts & Crafts revival rug in Karastan’s English Manor collection was adapted from Morris’ vine and pomegranate motifs. Pattern elements can be seen in his 1870’s tapestry design, stitched by London’s Margaret Beale and her daughters for their weekend country house. The stitch pattern was hand-drawn by me in December of 2008. Gradations within the red background, achieved by use of overdyed floss, depict use of natural dyes preferred by Morris. Some details were eliminated in order to accommodate miniature scale restrictions. 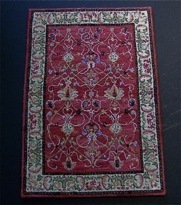 The 1” scale rug was stitched in single-wrap French knots on 100% cotton muslin. Approximately 40 knots per inch, using a single strand of cotton embroidery floss and a #12 crewel needle. Stitching and finishing were completed in March of 2010. Finished size: 5.8” x 4.2”. This miniature rug is based on a detail from William Morris’ first tapestry designed in 1877 and woven at Merton Abbey in 1885. The 9 x 5-foot tapestry is intact and on permanent display in Water House at Walthamstow, Morris’ childhood home and current site of the William Morris Gallery. By combining natural motifs, Morris created a sense of movement and elegance. He stressed the use of traditional techniques with natural materials and dyes. This miniature rug is a reproduction of a Craftsman Vineyard contemporary rug offered by Tiger Rug Company, purveyor of Himalayan wool rugs hand-woven in Nepal. The original rugs are made using hand-carded, hand-spun wool colored solely by natural dyes. It takes approximately one week for a master weaver in Nepal to hand-knot a single linear foot. The company bases its Craftsman Collection on authentic designs and motifs; this design’s origin is attributed to Stickley. Muted colors are chosen to complement Arts & Crafts revival interiors. The stitch pattern was hand-drawn by me in 2008. The use of overdyed floss in background areas represents color variations in the actual rug from use of natural dye techniques. Minor adjustments to colors were made due to personal preference. 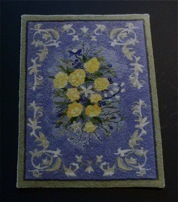 This 1” scale rug was stitched in single-wrap French knots on 100% cotton muslin. There are approximately 40 knots per inch, created using a single strand of cotton embroidery floss and a #12 crewel needle. Stitching and finishing were completed in 2009. Finished size is approximately 4” x 6”.